In addition to adding a layer of visual privacy, the right fence can also help with minimizing noise from outside of your property. In addition to adding a layer of visual privacy, the right fence can also help with minimizing noise from outside of your property. From cars to barking dogs, a fence is an excellent addition for enhancing the privacy of your space with reduced noise. As you are in the process of choosing a new fence for 2019, consider the many ways in which the right fence can reduce noise from around your property this year. While almost any fence will successfully add privacy to your yard, only a few will be exceptionally effective for reducing noise and bothersome sounds that you would otherwise hear throughout your neighborhood. Before you start measuring and thinking about height, consider which fence material and style will work effectively in your outdoor space. Wood fences, as well as vinyl fences, are excellent choices for adding privacy to your yard, as their full panels provide you with visual privacy and noise reduction. Once you have successfully chosen your new fence material, it is time to choose the height of your new fence. Do you have pets or children? This consideration will ultimately help to determine the right height for your fence. Higher fences are not only excellent choices for protecting children and pets, but they are also more effective for reducing noise from around your home. After your beautiful new fence is installed, incorporate trees, shrubs, and other outdoor features into your landscape to reduce noise from around your yard. 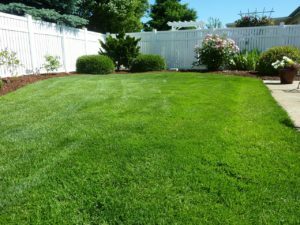 Not only will a beautiful landscape design enhance the overall look of your space, but it will also help to soften your yard for noise reduction. In addition to lessening the sounds coming from outside of your yard, this new layout of your landscape will also allow you to comfortably entertain in your outdoor space without worrying about the sounds escaping outside of your property.